Every Jewish home is a place of enormous kedusha (holiness). In fact, the marriage bond is a hint to each Jew’s spiritual connection above. Packed with real-life stories and practical tips, Career of Happiness is the ultimate marriage counselor. NEW! Includes thirty pages of question-and-answer about dating and shidduchim! Hard cover, 6x9, 193 pages. 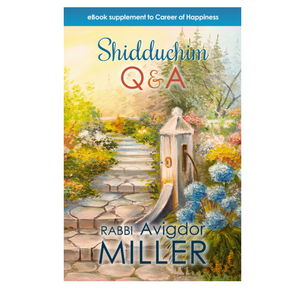 Download a copy of the e-book supplement, Shidduchim Q&A. It's got more than twenty more pages of question-and-answer about dating and shidduchim. It's just $3 — and it's FREE if purchased together with Career of Happiness! Rav Miller Z'tzls classic Chochmah! Really enjoyed the Sefer. Bought a copy for each of my children. Easy to read - gems on every page. Simchas Hachaim Publishing (SHP) is the official publisher of Rabbi Avigdor Miller's books and lectures. SHP is a project of Yeshiva Gedolah Bais Yisroel.